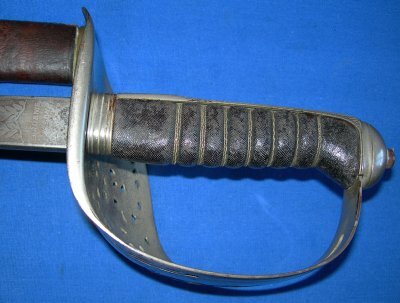 In good condition, a very nice 1897 Pattern British infantry officer's sword, marked to a Plymouth sword cutler. It is uncommon to find British infantry swords marked to sword cutlers / outfitters in naval areas, such as this one is; Etched on the ricasso to Adams & Son of Plymouth. The 32 inch blade is nicely etched and in good overall condition, plus firm in the hilt. 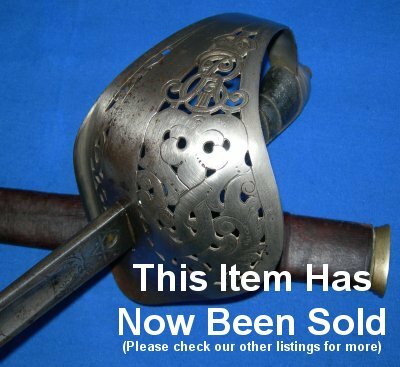 The steel hilt is also in good condition. The fishskin grip and associated twisted grip wire bindings are worn in places but good. The leather field service scabbard also worn but sound. This sword clearly was worn by the original owner officer for some time. The sword sheathes and draws well. A lovely example. Please quote item reference I25 (1054). Further / full sized images available upon request.